NOTE: wifi sync is no longer available as of TrailRunner 3.7 v709, use the dropbox sync instead. Record activities and send them to TrailRunner for analysis and journaling in the diary. 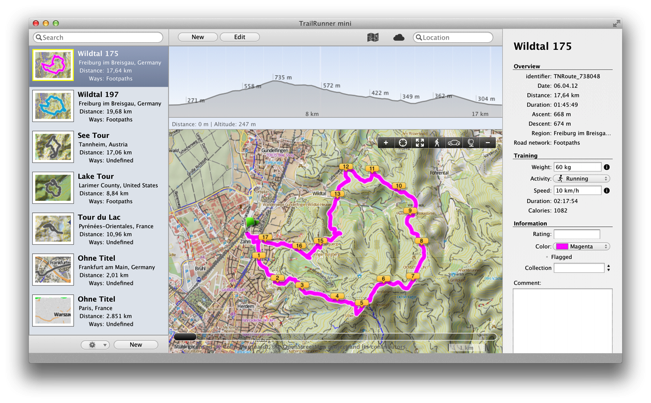 Plan a route in TrailRunner, send the track to RaceBunny and follow the course. GPS location recoding is being done using multitasking resulting in high resolution recoding data. On devices supporting app switching with multitasking, GPS recoding keeps running even when RaceBunny is running in the background. Go to Preferences > Synchronize and set RaceBunny as the iPhone partner application. Start RaceBunny on the iPhone. The selected route is being transferred to RaceBunny and is added to the list of routes. In the main document window, press the iPhone icon and in the left pane select the import-tab. In RaceBunny tap on the tracks button, select an activity and tap on the Send button. 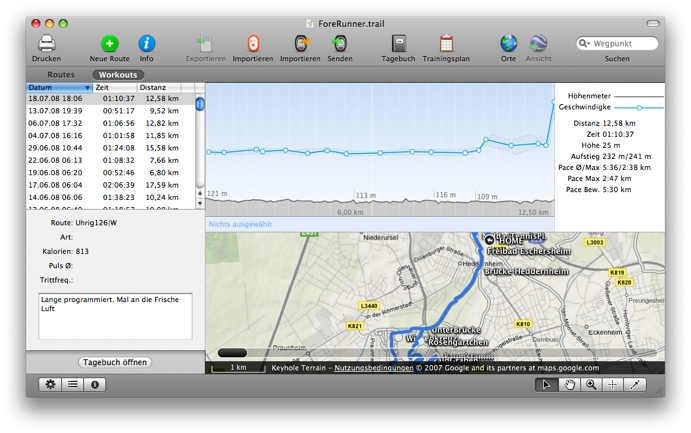 TrailRunner will open the import pane. Add additional comments and import the activity to your diary. To exchange data between TrailRunner and RaceBunny a domestic WiFi connection is being required. RaceBunny keeps recording your GPS location in the background. This works only on devices with multitasking support and this may also increase your battery consumption. MacOS 10.8 Mountain Lion is out and I have a new MacBook 15" Pro with retina. 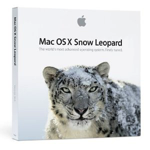 Unfortunately that hinders me to further support Mac OS 10.6 because apple ceased that support for my configuration. I don't like that but it's time to move on. With the fabulous help of many users, TrailRunner is localized to German, Swedish, Italian, traditional Chinese (Taiwan), French, Dutch and Japanese. To everyone who had completed the original translations or improved them by their comments, thank you very much! 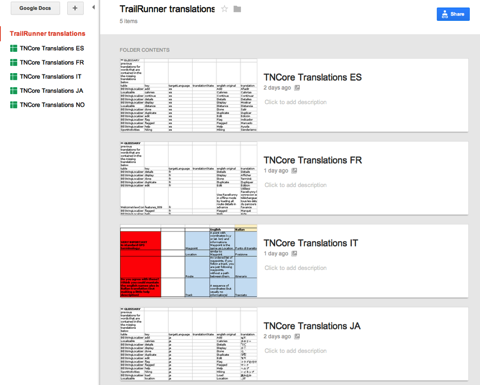 If you like to translate TrailRunner to your language or if you would like to supplement an existing translation, please contact me. 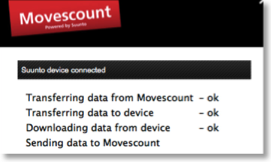 I added an importer for Suunto devices that works with the Suunto Movescount online service and the Suunto Moveslink interface. Moveslink is an application that connects your Suunto device to Movescount. Moveslink is always running when you start your computer so you can plug in your device any time. Set TrailRunner > Preferences > Synchronize > Helper Application to Suunto Moveslink. 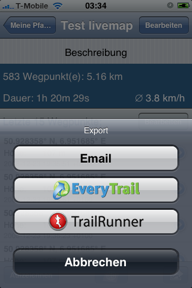 In TrailRunner click on the import from device button in the main application toolbar. The Suunto MovesLink application will start, automatically downloading your fitness data from your device and uploading the data to Movescount. 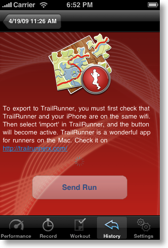 Quit the MovesLink application and follow the screen instructions in TrailRunner. 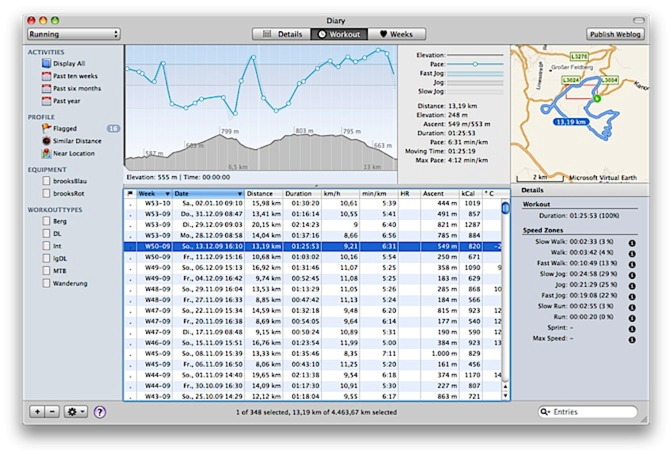 Please note that with all other device data, TrailRunner can only display fitness data that also contains distance information. In this case you should always wear a foot-pod. Added Support for the Garmin FIT file format. 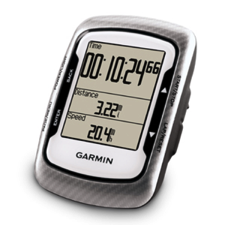 This is the new data storage format for the Garmin Edge 500 and newer devices. - In the Main document toolbar, click on the Import from device icon. - An import pane should now open on the left, decoding and displaying your stored activities. Recently I became a big fan of Dropbox, a free and secure online supported application to sync files between computers. Even if one Mac is at home and the other is at work or somewhere else. The reason I write this blog entry is that many user request a possibility to sync the diary between two computers. - Download and install Dropbox. - By default, the Dropbox application creates a new folder in your home directory called Dropbox. - Open this folder and make sure that a folder named Documents exists within. If not, create it with the exact spelling. - Within, find the folder named TrailRunner and move this into the aforementioned Documents folder. The guys over at slooping.net did a great review of TrailRunner including a 21 minute screencast explaining almost every feature of TrailRunner. To better meet the vocabulary being used in other applications, TrailRunner will no longer speak about workouts but activities. Also activities, routes and your network of tracks are displayed in a better UI. All application modes now come with their own dedicated toolbar at the bottom end of the window making the UI much more clearer. Operations on the action toolbar give you the toolset to effectively remove duplicate tracks and waypoints. A list of modified tracks on the left helps you in finding out what was newly added to your network and may contain duplications to be merged into your network of tracks. As you know, tracks can be spitted by a waypoint nearby. In previous versions of TrailRunner the maximum distance from a way-point to track to make this happen was a fixed value of 10 meters. In the new network of tracks editor, you now see this perimeter range around selected waypoints and you can drag the border to extend the range. This is especially useful when you have locations where great chaos lies within because many routes start and end somewhere around this spot. Now you can just increase the perimeter of one representative for this location and TrailRunner will then be able to better consolidate new elements within this area. Changed the Background Map to CloudMade openStreetMap Fine Line with a contour overlay. The community routes browser and importer now supports an improved API version for finding routes nearby on everytrail.com. Additionally TrailRunner hilights not only the location of routes nearby but also displays the tracks. So you now easily can view what courses the routes have. The diary window now displays a map and more statistical information on the selected activity. If you would like to help out with an updated or even new localization, please contact me. For better performance and for future extensions I rewrote the diary storage. Diaries are now based on a sport kind like running or biking. So in future versions diaries can have different parameters for calculations. 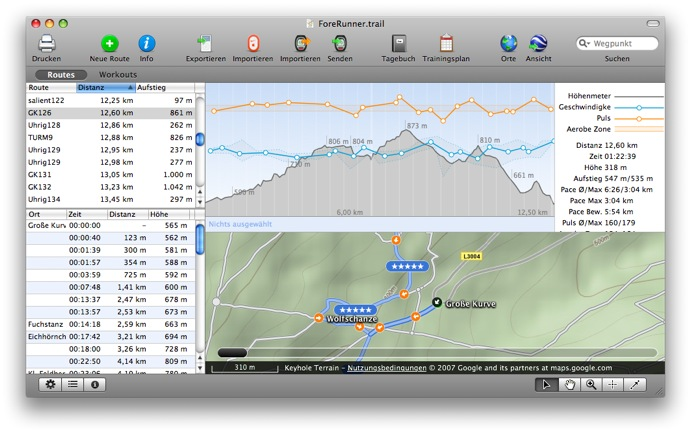 TrailRunner 2.1 will already honor speed units like distance per hour or minutes per distance for sport kinds and also will calculate calories with a different formula. This migration should solve many startup performance problems and will keep your mac responsive even with very large diaries. I do not know why I did not add this earlier but you can now trim workouts to be imported and routes within the map. Trimming means that everything from the edge up to and including the selection will be removed. 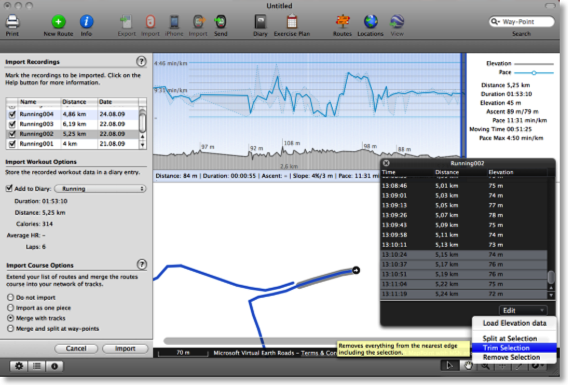 The screenshot shows a workout to be imported. You can either select something in the graph and then hit the backspace key or you open the track editor and use the Trim Selection command. 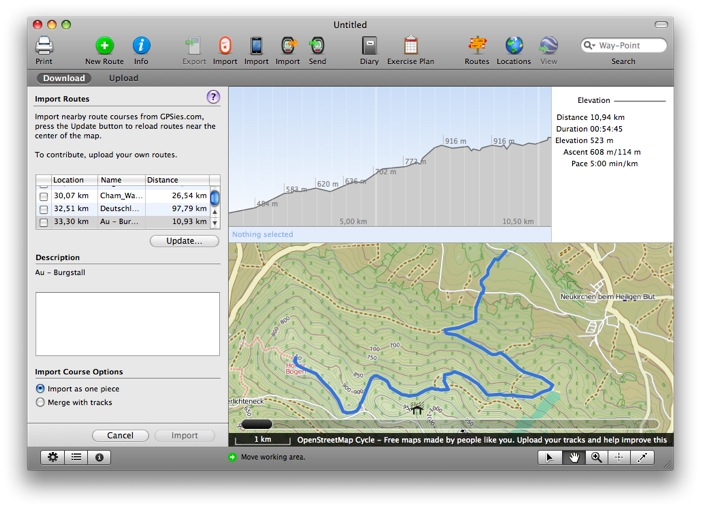 TrailRunner 2.1 can now import Lap information from LoadMyTracks gpx files. Also GPX files are being loaded much faster due to an asynchronous decoding. Same goes for large tcx files you drag onto the TrailRunner application icon or main window. The workout importer for non GPS workouts (the one that shows a list of routes below) now also displays a target diary selection menu. Though I highly recommend to remove any duplicate tracks within your map by following the instructions in the Mastering Track Merge tutorial, performance can be pretty bad with many long tracks on your map. In TrailRunner 2.1 I am testing a new display caching approach and have found results to be very good. Scrolling on my machine went up from 24fps to up to 60fps. But in most cases you should get 2x. General UI: Added a two finger zoom gesture for modern MacBook trackpads. Local Route Editor: Added a drag over track to be included rerouting where there was only a drag to way-point rerouting before. Streets Route Editor: Improved the OSM routing for very long route calculations. Weblog publish: I removed the private and public comment approach as it caused some trouble in the past. When you publish your weblog, all notes will be published. Export preserves timing: When you export tracks in TrailRunner, the original timing information will be preserved. This makes it posible to read data from your device and then later use an export for geo-tagging. Route Filtering: The main window search field now filters for routes that contain the given search string in either their name or in the name of any way-point they come across. For example: say a route has a name of biking and goes over a waypoint called ruin, then a search term of ru will find this route. To filter on way-point names only, whith this example just enter wp:ru into the search field. To filter on route-names only, enter rte:ru into the search field. As TrailRunner uses a new diary store, you should better make a backup of your old. Please note that even after the migration was done, a much smaller RunLog.xml will stay in place, as it still contains some legacy data. So should you require to migrate back, just delete this file. 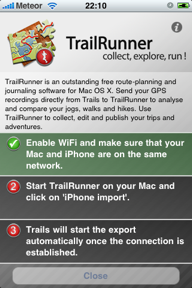 TrailRunner 2.1 has its own app-cast so if you download the version below, you will be notified on updates. Please give feedback in case you have any trouble with the migration or other stuff. 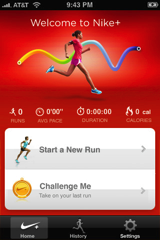 321Run is an iPhone coach for running. Learn to run more efficient, lose weight, increase your speed and get prepared for competitions. 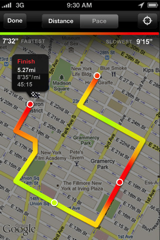 The app follows your runs with the GPS of your iPhone and records your run stats and tracks. You can then send these recordings over to TrailRunner. - Listen to how far you've gone and the duration of your training. - Set yourself goals and reach them during your workout. The Route exchange with GPSies.com, one of the world biggest routing portals, is now grouped in one management panel. 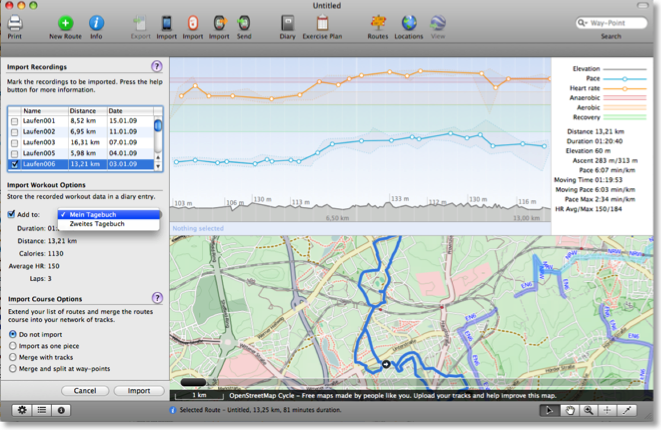 Added a Hiking, Running and Biking filter to the GPSies route import. Added routing service based on the Cloudmade/OpenStreetMap trail network. 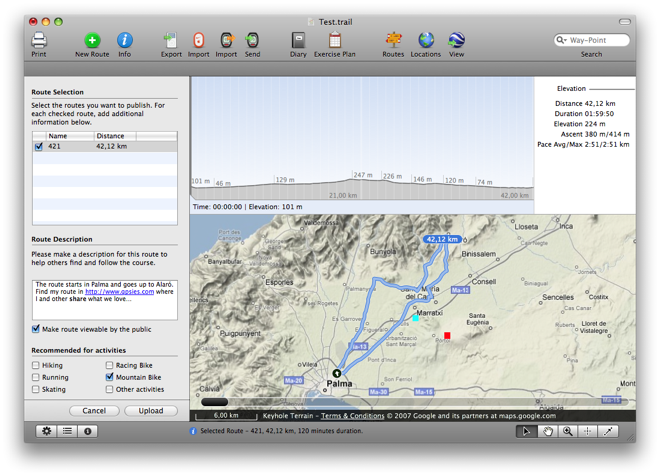 The route editor for routes based on the personal track network was rewritten from ground up. A new route management tool was added to the editing controls toolbar. Please read below, what the new features the new release has to offer. Thanks for everyone sending me bug reports and feedback. 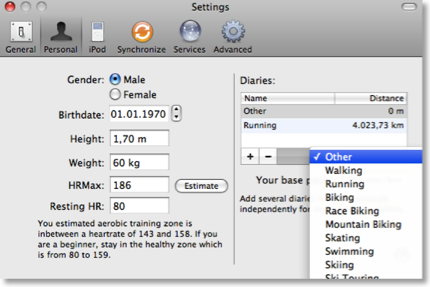 Now when you import a workout, you can choose what diary the diary entry for the workout should go into. 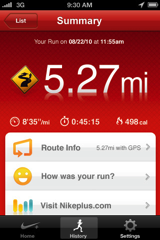 TrailRunner now imports lap information from your Garmin fitness device. As a side effect, TrailRunner displays average and maximum values stored in the device and does not calculate these if values are available. 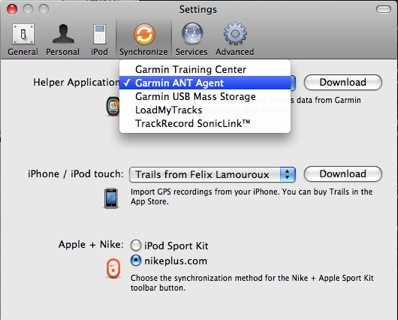 Open the application preferences and select the Garmin ANT Agent as your helper application. 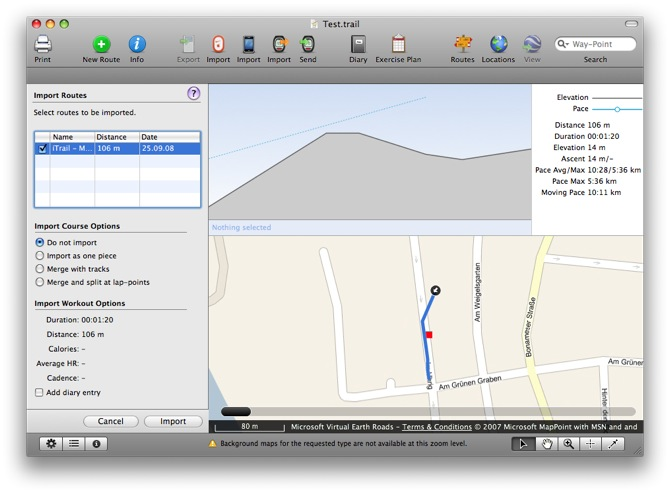 Press the Import Button in the main windows toolbar and follow the steps described there. Check the workouts you want to import either as a diary entry or (if available) as a route. 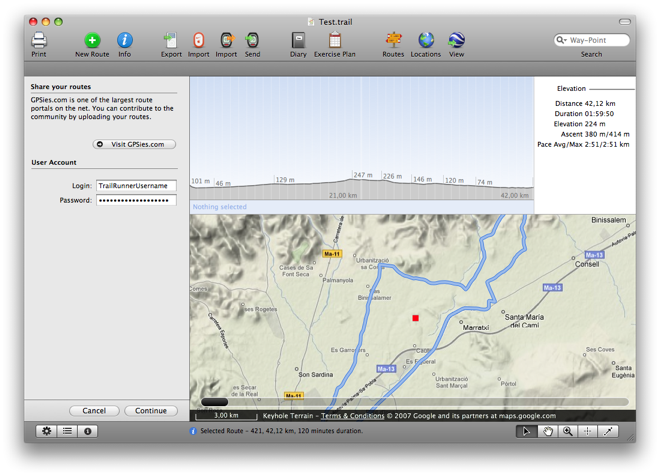 TrailRunner 1.9 is able to receive GPS recordings from yet another famous iPhone app called Trails written by Felix Lamouroux. Trails is the only GPS iPhone app that allows you to record, import and export tracks onto your iPhone. Trails is an iTunes Staff Favorite! If you did not already, buy Trails in the app store and make some route recordings. 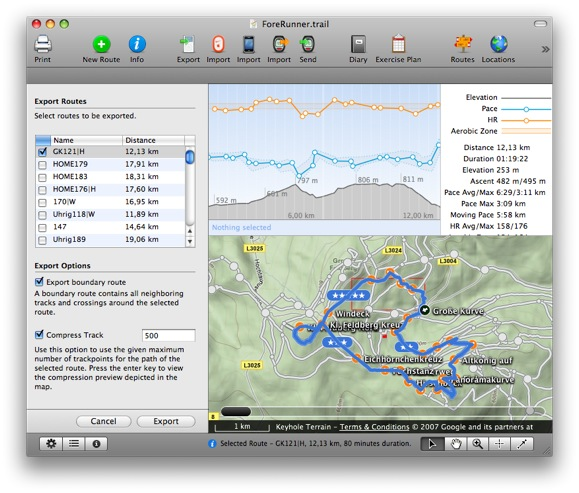 Please note that the TrailRunner and Trails data exchange requires TrailRunner version 1.9 and Trails version 1.8. A domestic Airport/Wifi network is required to transfer data from the iPhone onto your Mac. Start TrailRunner. Notice the iPhone control button in the toolbar. Press the control button. An importer pane will open on the left hand side of the main window. Follow the steps described there. 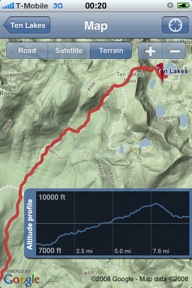 On your iPhone, open Trails and select a recorded track. 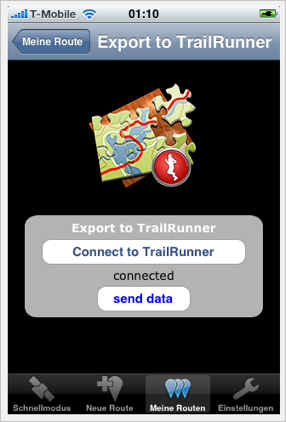 Press Export and press the TrailRunner button as depicted below. 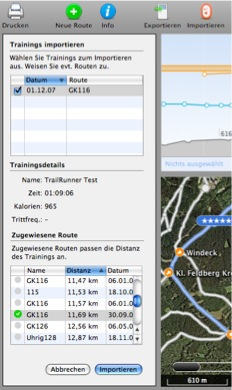 TrailRunner and Trails will detect each other automagically and the selected track will be transfered to TrailRunner. The course of the track will be depicted immediately in TrailRunner. 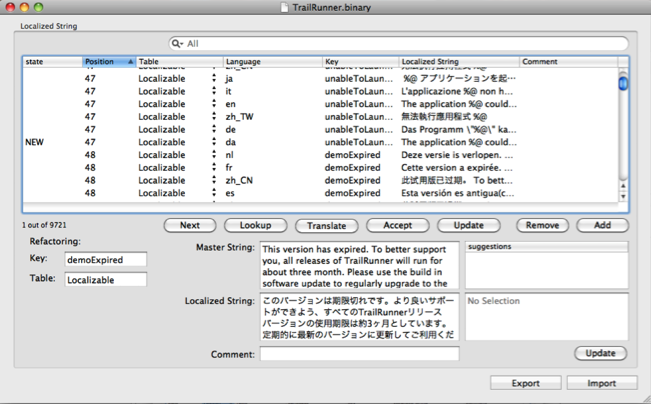 After the course was received in TrailRunner you’ll see the regular workout import pane you might already know. Choose any of the import options and probably add a diary entry for this recording. Route and Network Merge -- This now really works. 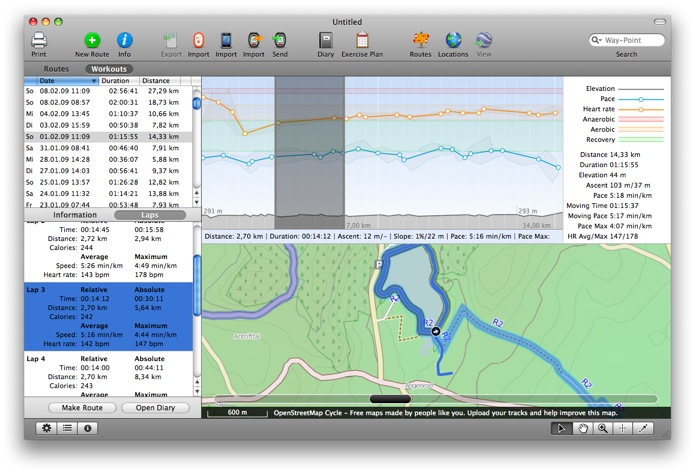 The most complex part of TrailRunner is now much faster and supports full undo for all operations. Intermediate Tracks -- Already introduced in 1.8 the algorithm is now capable to merge tracks and calculate an intermediate path. This is being done weighted meaning the more often you run a track course and intermediate-merge the recordings, the more accurate the elevation profile will get over time. Other parts I am working on are still hidden or unused so nothing to talk about at the moment. In case you would like to become a beta tester, please subscribe to MacDeveloper.net (see post below) I’ll post a first release soon. Happy Christmas and enjoy the holidays. In green the Energy Efficient or Recovery Zone, up to 60% of you maximum heart-rate to develop a basic endurance and aerobic capacity. In orange the Aerobic Zone, 60% up to 75% of your maximum heart-rate. Will develop your cardiovascular system. In red the Anaerobic Zone, 85% up to 90% of your maximum heart-rate. Training in this zone will develop your lactic acid system. 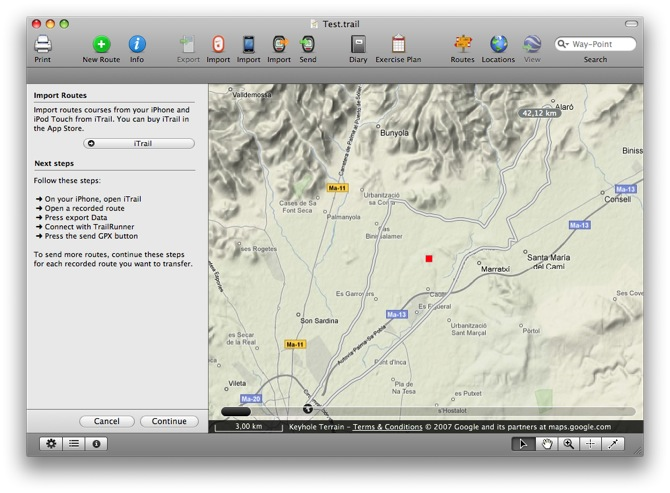 TrailRunner is now part of the MacDeveloper Testing Network. Because MacDeveloper uses a clean and structured interface to sort, comment and file bugs and feature requests I would suggest that everyone wanting to become a beta tester for TrailRunner subscribes to the Testing Network. But — as always — you can still contact me directly if you have any questions or general feedback. MacDeveloper is just another good way to communicate with me. As developing a decent iPhone application is as much work as developing huge parts of TrailRunner I decided to not write my own iPhone app but to partner with one of the existing ones. This companion application you can buy in the App store is iTrail. 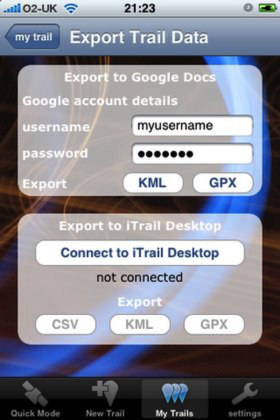 TrailRunner and iTrail require domestic Airport/Wifi network to transfer data from the iPhone onto your Mac. If you did not already, buy iTrail in the app store and make some route recordings. Start TrailRunner. You’ll notice a new icon in the toolbar if you are a first time user. Otherwise you can add this icon by control clicking the control bar and adding the new iPhone Icon. 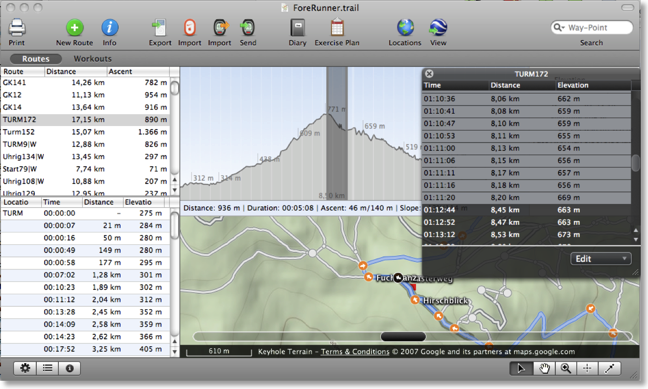 In the current version of iTrail (shown on the left), TrailRunner and iTrail Desktop are the same. This will change in the future to something like in the right screenshot (taken from a preview build of iTrail 1.7). It is important to know that TrailRunner can not interpret the proprietary CSV file format of iTrail. The GPX file format is the one you should choose for the transfer. One of the nice things with the Garmin Edge is that you can mount the device as a Harddrive on your mac. Then within the folder you see all workouts accomplised. It’s pretty easy to open these in TrailRunner. Just select a bunch and drag them onto TrailRunner and you’ll see them there. This week I implemented the other direction. 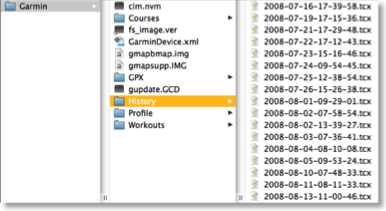 TrailRunner can now write the native file format for the newer Garmin devices, with the .tcx file extension. > Drag the Export as TCX icon into your toolbar. Next, when you like to export a route course onto your Edge, just select the route, press the Export button and save the route into the courses folder of the edge. You’ll find the new menu command under File > Share Routes. Get an account at GPSies.com and log in. Select the routes you want to share by placing a check mark. For each chosen route, enter your route description. If you’d like to reference to other websites for detail, TrailRunner will automatically detect hyperlinks. Select a suitable activity for your suggestion and press upload. Long on the list and now available: The integration with GPSies.com, the outdoor route sharing portal, has been improved. The route course lookup is accessible through either the File > Find Routes Nearby command or the new toolbar-icon. A new importer pane will open on the left displaying all routes available near the current map location. Browse, check and import what you like and use TrailRunners merge and planning options to individualize what others have already explored for you. 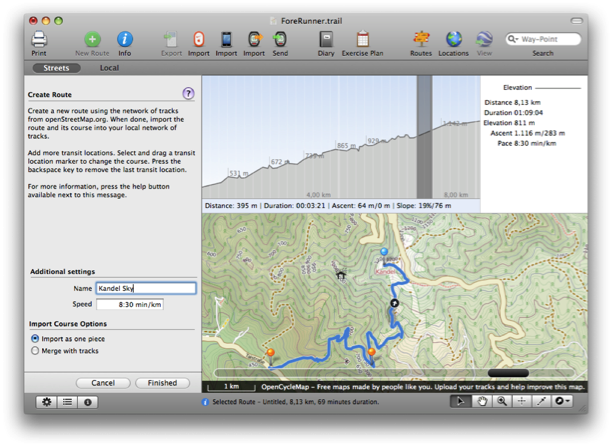 TrailRunner 1.8 is out ! Have fun and thanks for your feedback! Although already improved much in 1.7 this now should be it. 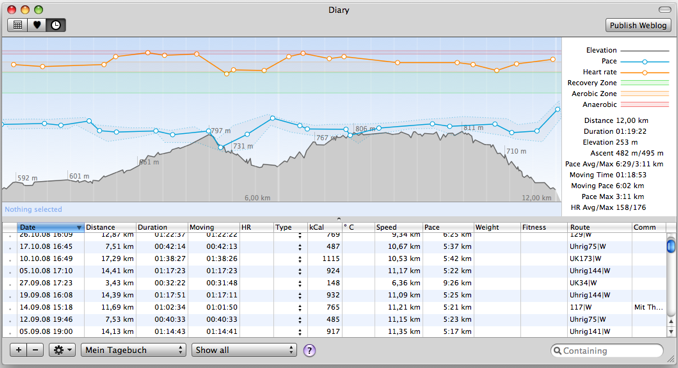 Selections within the profile chart, route slider, track editor and route description window are now fully synchronized. One of the biggest problems for TrailRunner newbies was, that the differences between a route and a workout / the main document and the diary wasn’t intuitively clear. So I now changed the interface to make both approaches available in the main window. As you might already know, the NanoMaps feature is available not only for the iPod nano but also for any kind of mobile device with a color-screen – especially for cellphones. To set the appropriate image-size the preferences for export allow you to set the width and height for the NanoMaps. For all who do not know the resolution of their device I started a collection for common devices like the T610 on the left. You can find the list in the Library. If you did successfully export your directions onto any device that is not listed there, please leave me a note what device you are using and the resolution that fits best on its screen. In general I expect you to transfer the NanoMaps onto your cellphone using the Bluetooth File Exchange Application. Browse your device and drag the images into its pictures directory. 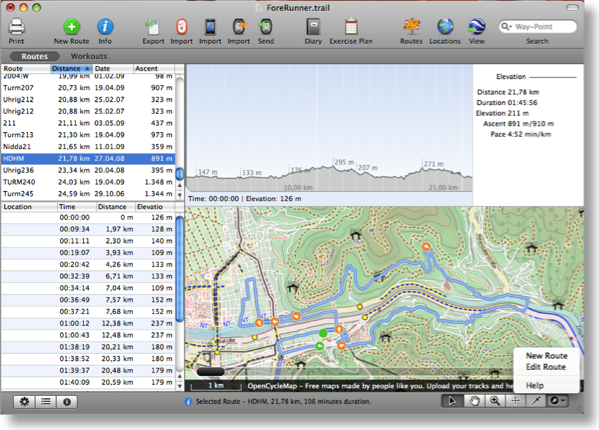 TrailRunner 1.7 is now out. 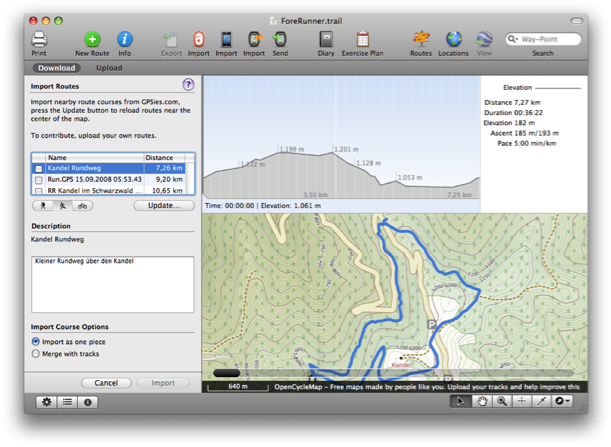 Please note that TrailRunner 1.7 requires MacOS X 10.5 Leopard to run. If you are still working under 10.4 Tiger, you can use the last 1.6 release. Development for the 1.6 release will be stopped from now on. Rewrote the merge elements algorithm to be more stable, faster and to support more operations to be undoable. It's not complete yet but given the fact that this is extremely complex, I am very happy with what I have learned and was able to dig out as the current core. Also reduced the geographic snap-in grid from 20 meters to 10 meters. I am at rewriting the old overall history diagram. Instead of the once fancy idea of having adaptive time intervals like "Summer 06" I now go the conservative way of weeks. The screenshot below should illustrate what I mean. As you can see the diagram type is identical to the workout analysis graph meaning you have the same analysis features. The weblog now also publishes a zoomed image along with the thumbnail left to the weblog entry. Click on the thumbnail to see the enlarged version. Find an example in my own weblog. 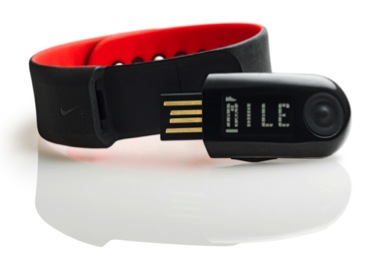 Originally I had planned to access the new Nike+ SportBand workout data much like I access an iPod. But it turned out to be impossible. But then I learned how easy it was (for me) to access a users complete workout store at nikeplus.com. The consequence? Register at nikeplus. Set goals, run competitions, put yourself into the spotlight and then download your personal data back into TrailRunner—on your Mac. It's your property. Find all this behind the Nike + Apple SportKit toolbar button. Release v216 already brought the first major rewrite of the layout track and layout route mimic. v217 will bring the next level, the adjust route mimic. Every weblog entry now has a new link that displays the attached route at GPSies. 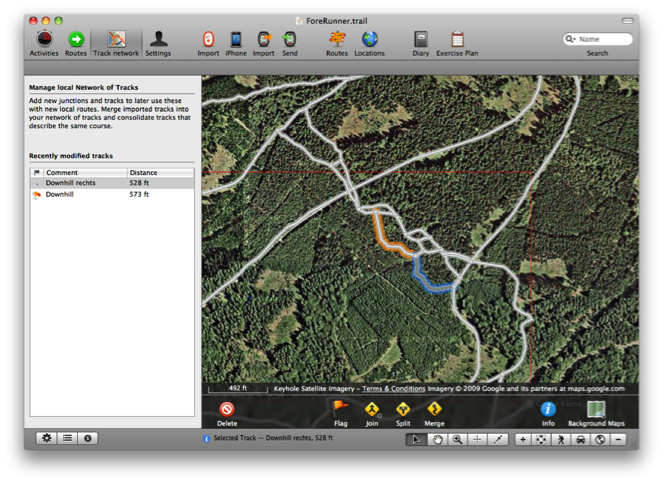 This makes it convenient for your visitors to quickly investigate the route and not just download the GPX or KML files. When GPSies has opened, you'll find a search pane on the right that will show you routes nearby. If you have found a route that is of any interest to you, download the route. Drag the downloaded file onto the TrailRunner application icon in your dock and you can merge the new route into your main document. I have the strong feeling I don't have to tell you how cool this is. - Select workouts to be imported and assign routes. 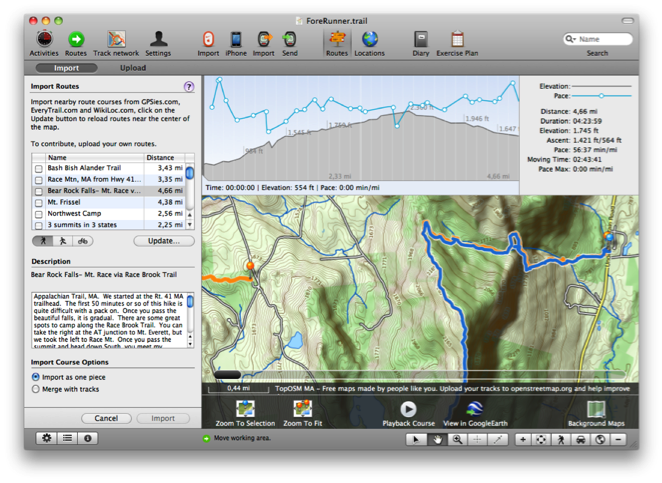 Assigning a route will then merge the workout recordings with the TrailRunner route, giving you a good overlay of both. 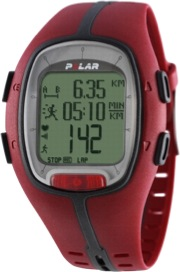 And this also answers one of the most frequently asked questions: TrailRunner requires your Polar recordings to contain distance information. If that is not the case, the workout can't be imported. The reason is that TrailRunner is distance based and not time based. To overlay a distance based route with e.g. heart-rate information, the workout recording must be in the same unit meaning to be distance based too. This is a core concept and a time based approach will never be implemented into TrailRunner. The next major release step will bring a highly requested and an intuitive new feature. Boundary route: The idea behind this is to get all crossings exported without exporting the whole track network. As a track network is not part of the conceptual background in GPX files, this "pseudo" route will act as a hull around the selected route. Unfortunately my Garmin ForeRunner is not able to display more than one course at a time but it might be useful in other cases. Compression: If you export more than one route into a GPX file the amount of data might overrun your devices memory limits. Compression might help to reduce the amount. A visual preview of the selected track depicts what the compressed track looks like. The latter new feature are track animations and a route slider. 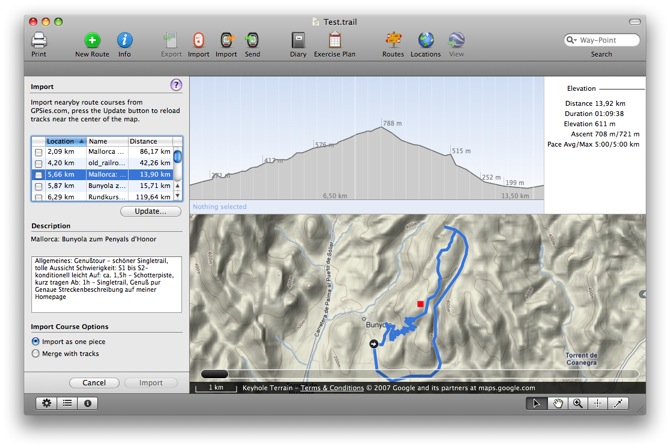 If you previously selected a checkpoint in the left hand table and used the arrow-down key to browse through the course of your route (what I do to memorize the course before I go out, even though you have electronical cheat sheets like NanoMaps and Send To GPS) TrailRunner will now retrace the course of the track segment up to the next checkpoint. 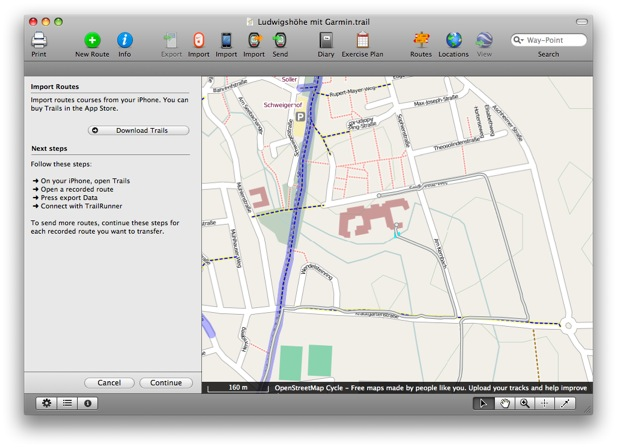 Additionally, the new route slider at the bottom of the map lets you browse through the course of the route much the same way as coverflow in Leopard does with files. 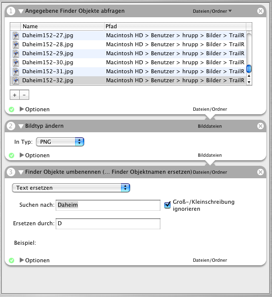 Close Preferences and open your main TrailRunner document. Press the Import (from heart rate monitor) Button in the upper tool-bar. 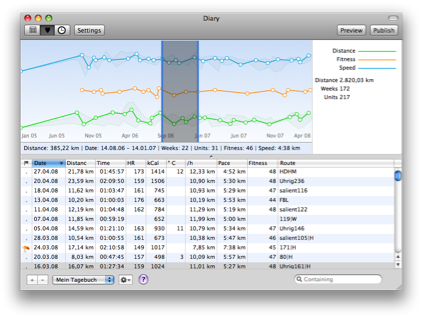 Now drag each exported workout session onto the main TrailRunner window, the import pane on the left will open. Select a matching route and press the add Button.